Warm and comforting meatloaf and spaghetti squash gratin. A few year’s back, in the midst a dangerous, experimental mac-and-cheese stage (old habits die hard), I was perusing my cookbooks for an accompaniment to what I considered the night’s gooey, cheesy main attraction. That’s when I ran across a recipe for old-fashioned meatloaf in my golden go-to, The Gourmet Cookbook. A departure from the meatloaf Mom baked in bread loaf pans, this version was mounded free-form into an oval dome on baking sheet and slathered with ketchup. It sounded interesting enough, so we gave it a try, and a few year’s later it’s now a wintertime staple. While I have served this many times alongside a creamy pot of macaroni, it’s a star in and of itself. On a recent Sunday, though, a spaghetti-squash gratin was the side to what I consider to be a magnificent meatloaf. Pasta-less and still craveable? Whoodathunk it? In a heavy skillet over medium heat, sautee the onions, celery carrots, green onions and garlic in olive oil for 10 minutes, stirring occasionally until the onions are translucent and the carrots are tender. Season with salt and black pepper. Add the Worcestershire sauce and 1/3 cup ketchup and stir, cooking for one additional minute. Remove from heat. In a large bowl, combine the the beef, pork, eggs, breadcrumbs and parsley. Incorporate the vegetable mixture into the meat, mixing with your hands. (Don’t over-mix.) Turn the meatloaf mixture onto a shallow baking pan, forming it into a mounded oval, about 10 by 5 inches. Spread the remaining 1/3 cup ketchup on the top. Bake in the oven for 1 hour or until the internal temperature reads 155 degrees. Remove from oven and loosely cover with foil. Let the loaf rest for 10 minutes before slicing. In a heavy saucepan, heat the olive oil over medium heat and add the garlic. Cook stirring for 1 minute. Add the tomatoes, crushed red pepper, oregano sprigs and thyme sprigs. Add salt and pepper to taste, and simmer for 20 minutes until thickened. Remove and discard the woody stems of the oregano and thyme. Set aside. In a bowl, combine the ricotta and the Parmigiano-Reggiano. Add the chopped oregano and thyme and season with salt and pepper. In a 9 by 13 casserole, make a base layer of spaghetti squash. Follow with a layer of tomatoes, spreading evenly over the squash. Top it off with the cheese mixture. Bake at 400 degrees for 50 minutes, or until lightly browned on top. 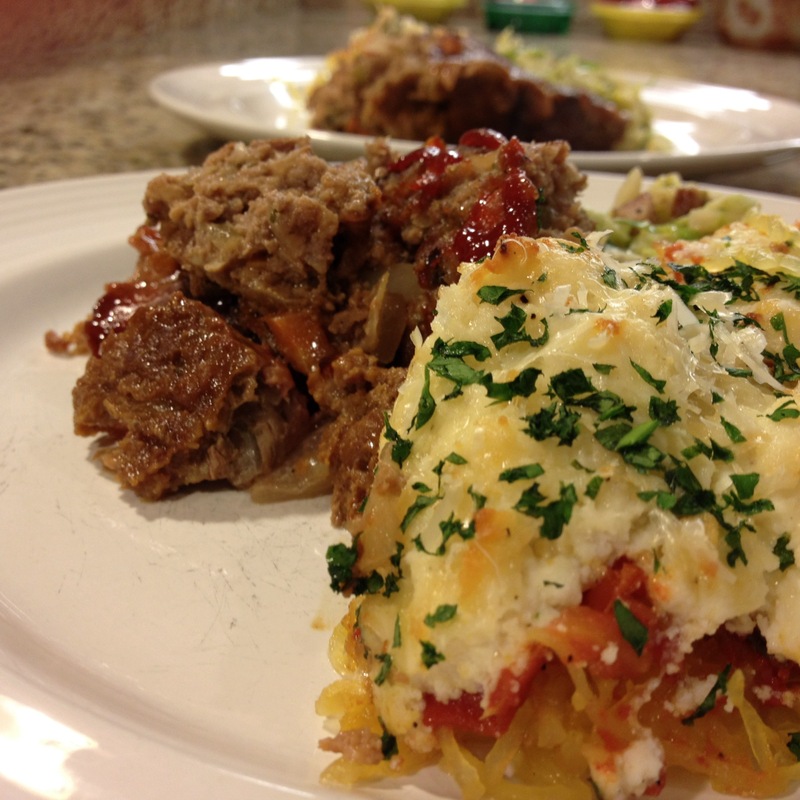 Comforting meatloaf and spaghetti squash gratin. The adding of the ketchup. Parsley, breadcrumbs, eggs. Mixing commences. The shaping of the loaf. Loaf with the secret ingredient: ketchup. Hoping beyond hope: Perhaps something will fall. Ha. Of course, everything in moderation. Especially moderation. Am I right? Tell me how it turns out! I think it’s pretty tasty, and using the microwave to cook the squash makes it very easy.